If you haven’t played Killer Instinct yet, I don’t really blame you, actually. Not everyone has an Xbox One, and $500 is a good chunk of change. However, if you do, it IS free to try, after all, so why not? Besides, I think it heralds a change in fighting games: less emphasis on showboaty stuff, and more on making sure both players are making decisions. Modern fighting games are heavily informed by Capcom’s Versus Series. I mean, not all of them; but there are a lot of games about flashy, exciting combos. It’s a great spectator sport, and there’s plenty of room to show off. But, what about the other guy who’s being comboed? Some games let you break one combo a round with some kind of burst mechanics. Other games just make you eat it. Here’s a combo video from Ultimate Marvel vs Capcom 3, and keep in mind that the person being comboed in all of these can do nothing. Killer Instinct is different: it allows you to be an active participant of the “eating a combo” process, and do something about it. 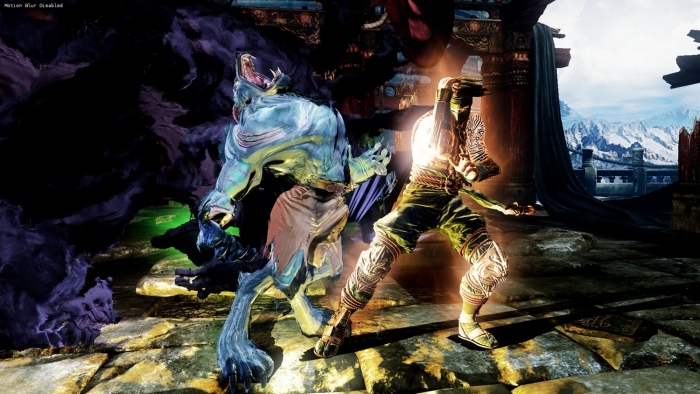 In Killer Instinct, there are three kinds of attack strengths. When you are doing a combo, you’ll use one of these attack strengths at each part of the combo. Your opponent, if he knows the button you used, can break your combo. While your opponent can’t prevent damage, by breaking, the damage you did will be minimal. Most of the damage done in a combo is done at the end. I don’t think anyone likes being comboed forever, but especially players new to the genre will likely throw down the stick and never pick it up again. It’s not that they’re getting shellacked out there; it’s that they have no control. Killer Instinct doesn’t take away control, it just puts the advantage in the attacker’s hands. Sabrewulf Activating Instinct mode, possibly to avoid a counter breaker. Rock, Paper, Scissors is a simple game, but imagine this one change: Rock is worth 10 points, Paper is worth 5 points, and Scissors is worth 1. Now what do you throw? In Killer Instinct, heavy attacks in combos do the most damage, but are the slowest and therefore easiest to break. Vice-versa for light attacks. An opponent can try to guess your preferences to break you, but guessing is only 33% effective. Also, a wrong guess causes a Lockout. When you are locked out, you cannot break combos and your opponent knows this. You’ll eat a decent number of heavy attacks and it’s all basically guaranteed damage. Of course, you might be good at breaking combos, frustrating the aggressor. There’s still a trick where if the attacker thinks a break is coming, he can perform a Counter Breaker. A defender that is Counter broken is locked out for a very long time, the combo limiter (a gauge that limits the length of combos) resets, and the announcer screams really loud, making the attacker feel so good and the defender feels… well, bad. Of course, if you think you’re going to get counter broken, you can stop your combo, and while the foe is in a counter breaker animation, start a combo again! 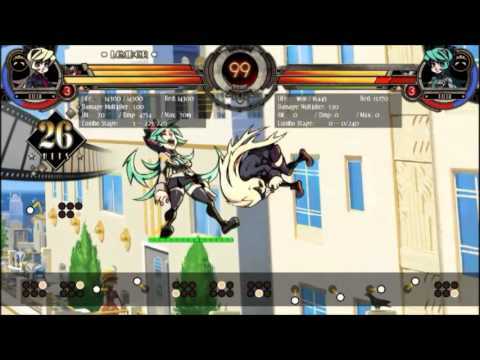 That green bar underneath the lifebars of the characters is the new undizzy meter. I just described a bit of the metagame around combos in Killer Instinct. Meanwhile, the metagame in other games is “Keep getting hit.” I am not saying KI’s approach is better, but look at a recent Skullgirls change which adds a new system that ends combos that are too long. Combos ending quicker means more time and more chances for the other player to make a comeback, or at least make substantive choices. If you are playing and you screw up ten times, and you get punished for each one, you probably deserve to lose the round. But one or two times is too harsh. There is a clear shift towards shorter combos, and more time spent making decisions in the fight. Expect to see these kinds of system changes in the latest fighting games. Now is this good? I don’t think Killer Instinct’s breakable combos fit every game. In fact, “Combo Breaker” is synonymous with Killer Instinct and that mechanic will probably remain with that game forever. I think the ability to pull off combos is a respectable skill, one that takes practice, and can be appreciated by those that watch it. But for the participants in the game, time spent being beaten around can be rough. Of course, players always need to be vigilant when they are being comboed in any fighting game, in case the attacker tries to go for a reset, leaving a small opening for the defender to make a comeback. However, at the highest end of things, there’s no need for ten-second eighty-hit combos. Crowds don’t cheer for long combos; they cheer the decisions and the plays made in the game. Thanks for commenting! We would appreciate, however, it if you would leave the fanboy comments at the door. We’re open to discussion but that is not necessary or tolerated. this is not a new thing though, this is how Killer Instinct has always been ever since the Snes. The new KI changes the way auto doubles work, and also introduces Counter Breakers… these two things alone add several layers.